– Start in a standard plank position, palms planted firmly on the ground. Maintain a straight line from your shoulders to your heels by engaging your core muscles. Your feet should be hip-width apart. – Lift your right leg two or three inches off the ground and bring your right knee towards your right elbow while keeping your hips as stable as possible. – Return your right leg back to the ground, and repeat on the left side. – Alternate legs at a brisk pace for 30 seconds. – Lie on your right side. 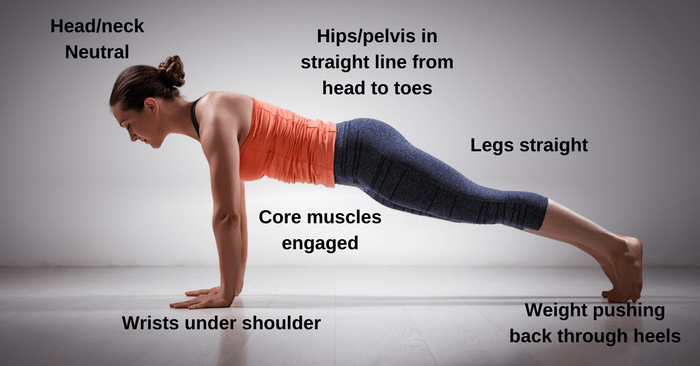 Place your right hand firmly on the ground and, engaging your core, raise your body up into a side plank, creating a straight line from your head to your toes. Your feet should be stacked on top of each other. – Extend your left arm out from your shoulder so it is straight up in the air. – Lower your arm in front of you and bring it below your right hip, like you are reaching for something behind you. Your shoulders and hips can twist a tiny bit, but your core should be working hard here. – Bring your arm back above your body, extended upwards from your shoulder. Repeat for 30 seconds, then switch to the left side and perform for 30 seconds. – For an extra challenge, hold a light dumbbell in your free hand.